Prairie dogs is the common name for any of the social, burrowing, North American rodents comprising the genus Cynomys of the [squirrel]] family (Sciuridae), characterized by a stout body with brown fur, short legs, short tail, and barking cries. Five extant species of Cynomys are recognized: black-tailed (C. ludovicinus), white-tailed (C. leucurus), Gunnison (C. gunnisoni), Utah (C. parvidens), and Mexican (C. mexicanus) prairie dogs. Extant prairie dogs are found in the United States, Canada, and Mexico. As ground-dwelling squirrels, they are closely related to chipmunks and marmots (including the groundhog). Prairie dogs play an important role in their ecosystems as part of food chains. Indeed, they may be considered keystone species, being the main food for various mammals (badger, swift fox, endangered black-footed ferret) and birds of prey (golden eagle, burrowing owls), as well as being preyed upon by rattlesnakes. Their tunnels also help in preventing erosion and runoff by channeling the water into the water table, and they help to reverse soil compacted by grazing cattle. And their tunnels serve as habitat for various vertebrate and invertebrate species. For humans, while some are raised as pets, those in the wild offer a unique sense of the wonder of nature. In the black-tailed prairie dog, the colonies ("towns") may involve thousands of individuals, extending over miles. Various behaviors, such as standing on the mounds near their holes watching for predators and even kissing among these social rodents, add to the delight one can experience for observing the prairie dog. However, prairie dogs also are often identified as pests and exterminated from agricultural properties because they are capable of damaging crops or reduce forage available for livestock, and they have been a source of concern about transmitting disease. Combined with habitat loss, their populations have been considerably reduced. Prairie dogs are a type of ground-dwelling squirrel. The squirrel family, Scuridae, includes tree squirrels, ground squirrels, and flying squirrels. Karels (2004) recognizes three tribes within the ground-dwelling squirrels: (1) Xerini (African ground squirrels and a central-Asian ground squirrel); (2) Marmotini (marmots, antelope squirrels, prairie dogs, ground squirrels, and Chinese rock squirrels); and (3) Tamiini (the chipmunks). Sciurids, like all rodents (order Rodenta), are noted for their teeth. They have a pair of large incisors on the upper and one on the lower jaw that grow continuously and need to be kept short and sharpened by frequent gnawing. Prairie dogs (genus Cynomys) are stout-bodied rodents that grow to be between 12 and 16 inches (30-40 centimeters) long, including the short tail, and weigh between 1 and 3 pounds (0.45-1.4 kilograms). All five species are similar in appearance, having small ears, short legs with claws, and short and flat tails. They also are all gregarious rodents that live in colonies with a well-defined structure (Karels 2004). In Mexico, prairie dogs are primarily found in the northern states, which are the southern end of the Great Plains: northeastern Sonora, north and northeastern Chihuahua, northern Coahuila, northern Nuevo León, and northern Tamaulipas. In the United States, they range primarily west of the Mississippi River, though they have also been introduced in a few eastern locales. They also occupy part of southern Canada. Prairie dogs are named for their habitat and warning call, which sounds similar to a dog's bark. The name prairie dog is attested to from at least 1774 (Harper 2001). The 1804 journals of the Lewis and Clark Expedition note that in September 1804, they "discovered a Village of an annamale the French Call the Prarie Dog which burrow in the grown" (Clark 1804). Its genus, Cynomys, derives from the Greek for "mouse dog." The highly social prairie dogs live in large colonies or "towns"&mash;collections of prairie dog families that can span hundreds of acres. Families usually consist of 1 male and 2 to 4 females living in a strict social hierarchy (Slobodchikoff 2002). Prairie dog pups reach sexual maturity at about 3 years of age, and after their third winter, the dominant male in a given family will drive them away, forcing them to establish their own families on the edges of the colony. 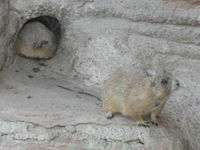 The dominant male will defend the family's borders against rival prairie dogs, and disputes are resolved with fighting. Prairie dogs are also aggressive against predators such as badgers and snakes. Prairie dogs are social animals, however, and often make social visits with each other, and greet each other with a sort of kiss (Mondadori 1988). Prairie dog tunnel systems help channel rainwater into the water table to prevent runoff and erosion and can also serve to change the composition of the soil in a region by reversing soil compaction that can be a result of cattle grazing. The tunnels usually have several chambers. Tunnels can descend vertically as much as 5 meters (16 feet), and can extend laterally as much as 30 meters (100 feet). Prairie dogs line their burrows with grass to insulate them, and the earth excavated from the burrow is piled up in mounds around the burrow's entrance. The prairie dogs use these carefully maintained mounds as observation posts (Mondadori 1988). The prairie dog is well adapted to predators. Using its dichromatic color vision, it can detect predators from afar and then alert other prairie dogs to the danger with a special, high-pitched call. 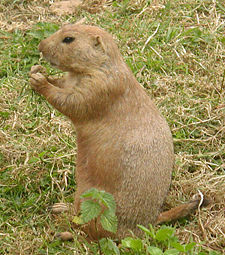 Slobodchikoff (2002b) and others assert that prairie dogs use a sophisticated system of vocal communication to describe specific predators (RedOrbit 2004). Prairie dogs also trim the vegetation around their colonies, perhaps to remove any cover for predators (NGPC). Their burrows generally contain several routes of escape (Slobodchikoff 2002). The prairie dog is chiefly herbivorous, though it eats some insects. It feeds primarily on grasses and, in the fall, broadleaf forbs. Prairie dogs have 1 to 6 pups (babies) yearly, which are born blind and fur-less and need about 30 days of close nurturing from their mother. A black-tailed prairie dog forages above ground for grasses and leaves. Ecologists consider this rodent to be a keystone species. They are an important prey species, being the primary diet in prairie species such as the black-footed ferret, the swift fox, the golden eagle, the badger, and the ferruginous hawk. Other species, such as the mountain plover and the burrowing owl, also rely on prairie dog burrows for nesting areas. Even grazing species such as bison, pronghorn, and mule deer have shown a proclivity for grazing on the same land used by prairie dogs. It is believed that they prefer the vegetative conditions after prairie dogs have foraged through the area. Many creatures that prey on them are threatened. However, prairie dogs are often identified as pests and exterminated from agricultural properties because they are capable of damaging crops, "causing undesirable spread of brush" (RSRL) and clearing the immediate area around their burrows of most vegetation (Slobodchikoff et al. 1991). However, in general they prefer disturbed or overgrazed habitat, although they can reduce the amount of forage for cattle and other livestock (Honeycutt 2004). A prairie dog and his hole. As a result, prairie dog habitat has been impacted by direct removal by ranchers and farmers as well as the more obvious encroachment of urban development, which has greatly reduced their populations. The largest remaining community comprises black-tailed prairie dogs. In spite of human encroachment, prairie dogs have adapted, continuing to dig burrows in open areas of western cities. One common concern that led to the widespread extermination of prairie dog colonies was that their digging activities could injure horses (Barr 1940), by fracturing their limbs. However, according to Durso and Motavalli (2004), "after years of asking ranchers this question, we have found not one example." Another concern is their being carriers of the bubonic plague, although they rarely transmit it to humans (Honeycutt 2004). Prairie dogs are gaining popularity as zoo animals. Until 2003, primarily black-tailed prairie dogs were collected from the wild for the exotic pet trade in Canada, the United States, Japan, and Europe. They were removed from their underground burrows each spring, as young pups, with a large vacuum device. They are difficult to breed in captivity, but it has been done on several occasions. Removing them from the wild was a far more common method of supplying the market demand. They can be difficult pets to care for, requiring regular attention and a very specific diet of grasses and hay. Each year they go into a period called rut that can last for several months, in which their personalities can drastically change, often becoming defensive or even aggressive. Despite their needs, prairie dogs are very social animals and come to almost seem like they treat humans as members of their colony, answering barks and chirps, and even coming when called by name. In mid-2003, due to cross-contamination at a Madison, Wisconsin-area pet swap from an unquarantined Gambian pouched rat imported from Ghana, several prairie dogs in captivity acquired monkey pox, and subsequently a few humans were also infected. This led the CDC to institute an outright ban on the sale, trade, and transport of prairie dogs within the United States (CDC 2008). The disease was never introduced to any wild populations. The European Union also banned importation of prairie dogs in response. Prairie dogs that were in captivity in the United States at the time of the ban in 2003 were allowed to be kept under a grandfather clause, but they may not be bought, traded, or sold, and transport was only permitted to and from a veterinarian under properly quarantined procedures. While largely seen by exotic pet owners and vendors as unfair, the monkey pox scare was not the only zoonosis incident associated with prairie dogs. Prairie dogs are also very susceptible to bubonic plague and many wild colonies have been wiped out by it (FWS 1999; Reid 2004; Robbins 2006; Hoogland 1995). 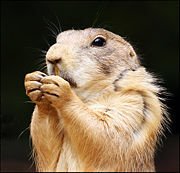 Also, in 2002 a large group of prairie dogs in captivity in Texas were found to have contracted tularemia (AVMA 2002). On September 8, 2008, the FDA and CDC rescinded the ban making it once again legal to capture, sell, and transport prairie dogs effective immediately (FDA 2008). Although the federal ban has been lifted, several states still have their own ban on prairie dogs in place. The black-tailed prairie dog (Cynomys ludovicianus) was first described by Lewis and Clark in 1804 during the Lewis and Clark Expedition (Clark 1804). Lewis described it in more detail in 1806, calling it the "barking squirrel" (Lewis 1806). Prairie dog blends into its surroundings. American Veterinary Medical Association (AVMA). 2002. Tularemia outbreak identified in pet prairie dogs. Journal of the American Veterinary Medical Association October 1, 2002. Retrieved December 20, 2008. Barr, V. D. 1940. The diary of Virginia D. (Jones-Harlan) Barr. Kansas Heritage. Retrieved December 20, 2008. Centers for Disease Control (CDC). 2008. Questions and answers about monkey pox. CDC. Retrieved December 20, 2008. Clark, W. 1804. 7th September Friday 1804. Journals of the Lewis and Clark Expedition. Retrieved December 20, 2008. Durso, F., and J. Motavalli. 2004. For saving endangered prairie dogs, it’s the eleventh hour. Emagazine XV(4)(July/August). Retrieved December 20, 2008. Fish and Wildlife Service (FWS). 1999. Plague and black-tailed prairie dogs. U.S. Fish and Wildlife Service. Retrieved December 20, 2008. Food and Drug Administration (2008). Control of communicable diseases: Restrictions on African rodents, prairie dogs, and certain other animals. 21 CFR, Parts 16 and 1240. Federal Register / Vol. 73, No. 174. Retrieved December 20, 2008. Harper, D. 2001. Prairie. Online Etymology Dictionary. Retrieved December 20, 2008. Hoogland, J. L. 1995. The Black-Tailed Prairie Dog: Social Life of a Burrowing Mammal. Chicago: University of Chicago Press. ISBN 0226351173. Honeycutt, R. L. 2004. Rodentia. Pages 121-129 in B. Grzimek et al., Grzimek's Animal Life Encyclopedia, 2nd edition, vol. 16, mammals V. Detroit, MI: Thomson/Gale. ISBN 0787657921. Karels, T. 2004. Squirrels and relatives IV. Ground squirrels. Pages 143 to 161 in B. Grzimek et al., Grzimek's Animal Life Encyclopedia, 2nd edition, vol. 16, mammals V. Detroit, MI: Thomson/Gale. ISBN 0787657921. Lewis, M. 1806. Tuesday July 1st 1806. Journal of the Lewis and Clark Expedition. Retrieved December 20, 2008. Mondadori, A. 1988. Great Book of the Animal Kingdom. Arch Cape Press. ISBN 0517667916. Natural Science Research Laboratory (RSRL), Texas Tech University. n.d. Black-tailed prairie dog. Mammals of Texas. Retrieved December 20, 2008. Nebraska Game and Park Commission (NGPC). n.d. Prairie dog. Nebraska Game and Park Commission. Retrieved December 20, 2008. Nowak, R. M. 1999. Walker's Mammals of the World, Vol. 2. Baltimore: Johns Hopkins University Press. ISBN 0801857899. Redorbit. 2004. Scientist: Prairie dogs have own language. Redorbit. December 4, 2004. Reid, D. 2004. Biologist studies plague and prairie dogs. California State University Fullerton. Retrieved December 20,2008. Robbins, J. 2006. Endangered, rescued, now in trouble again. The New York Times, April 18, 2006. Slobodchikoff, C. N. 2002. Cognition and communication in prairie dogs,. In M. Bekoff, C. Allen, and G. Burghardt, eds., The Cognitive Animal: Empirical and Theoretical Perspectives on Animal Cognition. Cambridge, MA: MIT Press. ISBN 0585436878. Retrieved December 20, 2008. Slobodchikoff, C. N., J. Kiriazis, C. Fischer, and E. Creef. 1991. Semantic information distinguishing individual predators in the alarm calls of Gunnison's prairie dogs. Animal Behav. 42: 713-719. Retrieved December 20, 2008. This page was last modified on 22 December 2008, at 15:30.